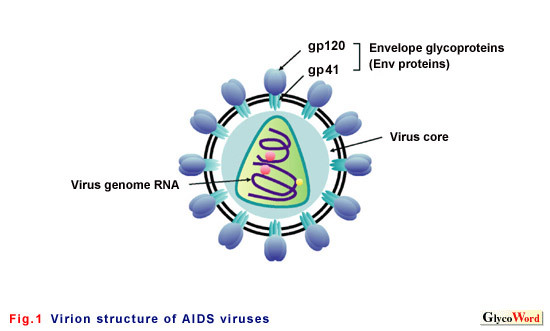 Envelope proteins of the AIDS virus (Env) that form viral spikes consist of gp120 and gp41 (Fig. 1). Gp120 comprises carbohydrates more than spike proteins of other viruses. Gp120 consists of a peptide with 500 amino acid residues and 22 to 26 N-linked glycans (Fig. 2). This structure of Env, wrapped in carbohydrate, is associated with the properties of the AIDS virus: evading host immune response in infected host and binding to target cells during infection. 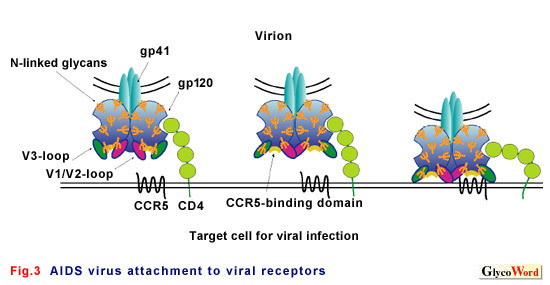 In virus entry, Env binds two receptors on target cells, CD4 and a chemokine receptor (CCR5 or CXCR4) (Fig. 3). Thus, Env is potentially a primary target of neutralizing antibodies (NAb). However, as described, most of the surface of the polypeptide part of Env is covered by abundant carbohydrate. Furthermore, the binding site for the chemokine receptor in gp120 critical for viral entry is hidden by loop structures formed in polypeptide part before binding to CD4. Therefore, effective NAb against AIDS virus is rarely induced. However, there have been reports that removal of parts of the carbohydrate improved induction of NAb 1 and that changes in N-glycosylation sites were associated with the emergence of neutralization escape mutants 2. Twenty-three N-linked glycosylation sites reside in gp120 of a simian immunodeficiency virus (SIVmac239). We created a deglycosylation mutant .Δ5G that lacks 5 N-glycans by mutation in the N-glycosylation sites (Fig. 2). Δ5G replicated with a similar kinetics as SIVmac239 in stimulated rhesus PBMCs 3. Next, we infected rhesus macaques with Δ5G and examined SIV infection and host immune response 4. SIVmac239 replicated vigorously with a peak at 2 weeks post infection during acute infection. Thereafter, a high level of SIVmac239 replication persisted and developed into AIDS in 2 years post infection. 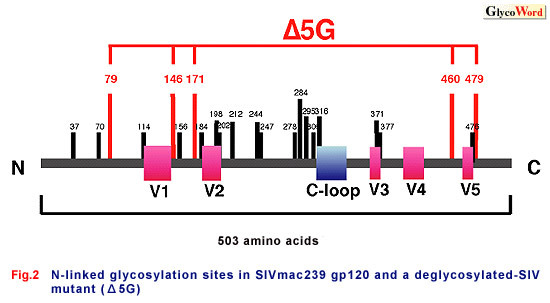 In contrast, although Δ5G replicated vigorously similar to SIVmac239 in the acute infection, Δ5G infection was suppressed with a viral load less than the detection limit in chronic infection 4. We speculated that Δ5G infection was controlled by NAb as described above. Whereas significant NAb against delta5G was detected in delta 5 infected animals, we also observed macaques with low or undetectable NAb. Furthermore, significant cell-mediated immunity were indued in the latter cases. The results indicate that deglycosylation not only improved immunogenicity but also virological properties such as difference in target cell tropism. From the in vitro study on viral properties, we found that Δ5G is macrophage tropic and exhibits CD4 independency for viral entry into target cells. This is distinct from the parental pathogenic SIVmac239 that is T cell tropic, requires both CD4 and CCR5 for viral entry and poorly replicates in macrophages. These properties are determined by the expression of viral receptors on the surface of target cells and the viruss receptor usage. Namely, the T cell tropic virus uses CD4 and CCR5 for viral entry, therefore infects CD4 T cells that express both molecules. In contrast, macrophage tropic virus infects the macrophages that express only CCR5. Thus, the macrophage tropic virus is capable of infecting macrophages independent of CD4 (CD4 independency). Accordingly, we speculate that deglycosylation may also affect the target cells and tissues in the infected animals by changing the cell tropism of the viruses. Δ5G-infected animals were protected from challenge infection with a pathogenic SIV. So far, experimentally, attenuated viruses exhibited the best effective vaccine efficacy. However, since it has been demonstrated that attenuated SIVs reverted to pathogenic viruses in long-term infections, safety is the most important issue regarding the attenuated virus vaccines. Although Δ5G is less pathogenic than other attenuated SIVs, its efficacy is similar to that of other attenuated vaccine strains. There are many issues that must be solved in the use deglycosylation mutants as AIDS vaccines. Better understanding of the mechanism by which Δ5G infection induces protective immunity may lead to a novel strategy in AIDS vaccine development.